You will need React Native and Yarn installed on your machine. Some familiarity with React Native will be helpful. Of course, we cannot hope to cover everything about accessibility. It’s a pretty big subject and it’s a continuous journey. There’s always something that you can improve in order to make the experience just a little bit more pleasant for a certain user. Instead, what we hope to achieve in this tutorial, is to take that first step into making more accessible apps. You can view the code used in this tutorial on its GitHub repo. 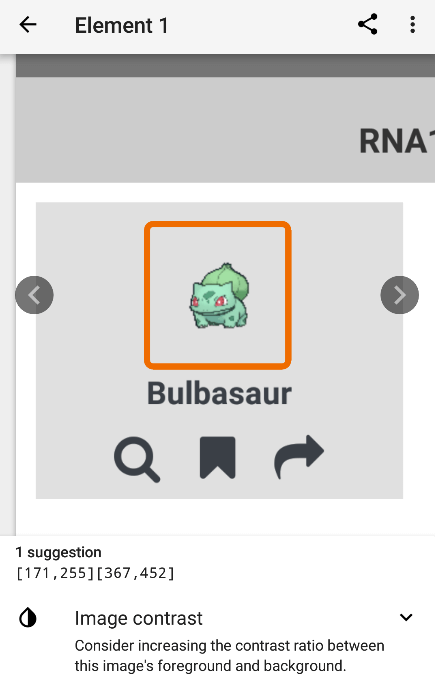 The starter branch contains the not so accessible version of the app, while the a11y branch contains the more accessible version. To follow this tutorial, you need to know the basics of creating a React Native app. The React Native development environment should also be set up on your machine. We will be using React Native version 0.56 in this tutorial. We’ll also be using Yarn to install packages. Visual impairments - examples include low vision, color-blindness, and total blindness. Physical or motor disabilities - cerebral palsy, bone and joint deformities. Mental disorders - autism spectrum disorders such as Asperger’s syndrome, and autistic disorder. Hearing impairment - deafness and partial hearing loss. Accessibility means designing your apps in such a way that it takes all of these disabilities into consideration in order to make the user experience pleasant for everyone. This won’t be how the final output will look like because we’ll also be taking design into consideration (though, only a little because I’m not really a designer). Right off the bat, you can see that the starter app violates some of these rules. The app is already following a few, but we can still improve on it. Once that’s done, the content should now be more readable. Next, we need to make the buttons larger. This change is specifically useful for people with physical and motor disabilities, as they’re often the ones who have difficulty in pressing small buttons. If you inspect the app right now, you’ll see that there’s not much space we can work with. So even if we make the buttons larger, it will still be difficult to target a specific one because there won’t be ample whitespace between them. Though we still have some free space between each card so we’ll make use of that instead. At this point, each button should be huge and visible enough to click on. Unfortunately, this isn’t really something that can be implemented all the time because of design constraints. If you check the app now, you’ll see that there’s not really enough space to accommodate labels for each button. There is a solution, but we will end up giving up the current layout (two cards per row) for a one card per row layout. So the only feasible solution is to have a walkthrough for new users. This way, you can teach what each button is used for. I won’t really be covering how to do that, but there’s a good component which allows you to implement it easily. In my opinion, the app already has pretty good contrast. But to be on the safe side, we’ll tweak it some more. Once that’s done, the app’s design should be pretty accessible. The previous section discussed mainly the visual component of accessibility. In this section, we’ll look at how to make the app more accessible for people who use screen readers. For those unfamiliar, a screen reader reads to users what they’re currently touching on the screen. This technology is mainly used by blind or visually impaired people. If a screen reader is enabled, the user has to double tap in order to activate the intended action. accessible - accepts a boolean value that’s used to mark whether a specific component is an accessible element or not. This means that the screen reader will read whatever label you put on it. Be careful with using this though, as it makes all of its children inaccessible. In the Header component above, this makes the Text component inside the View inaccessible. So the screen reader won’t actually read the title indicated in the header. It will only read the accessibilityLabel you’ve passed to the View instead. It’s a good practice to only set the accessible prop to true if you know that the component doesn’t have any child that’s supposed to be treated as an accessible element. accessibilityLabel - the text you want the screen reader to read when the user touches over it. A good practice when using this prop is to be as descriptive as possible. Remember that the user will only rely on what’s being read by the screen reader. They actually have no idea of the context a specific component is in, so it’s always useful to repeat it in your labels. 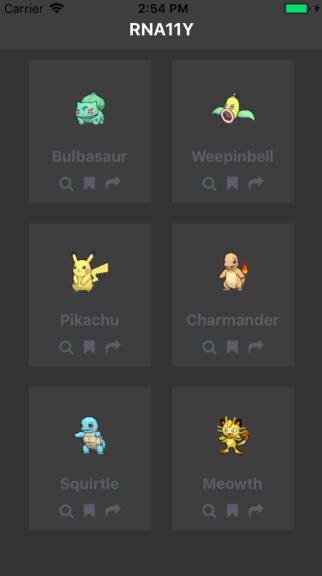 For example, each of the buttons in each card should still mention the name of the Pokemon. accessibilityRole - the general role of the component in this app. Examples include: button, link, image, text, and in this case header. Note that header doesn’t only indicate the app’s main header. It can also indicate a section header or a list header. From the code above, you can see that we’re accepting a new label prop which we then use as the value for the accessibilityLabel. We’ve also set the component to be accessible which means that when the user’s finger goes over it, the screen reader will read out the accessibilityLabel. But what about accessibilityTraits and accessibilityComponentType? Well, they are the old way of setting the accessibilityRole. accessibilityTraits is only for iOS and accessibilityComponentType is only for Android. As mentioned in the docs, these props will be deprecated soon. We’re only using it because TouchableOpacity doesn’t seem to be accepting accessibilityRole. The trait (button) wouldn’t show up as I was testing with the accessibility inspector. We’ll go over this tool in the next section. 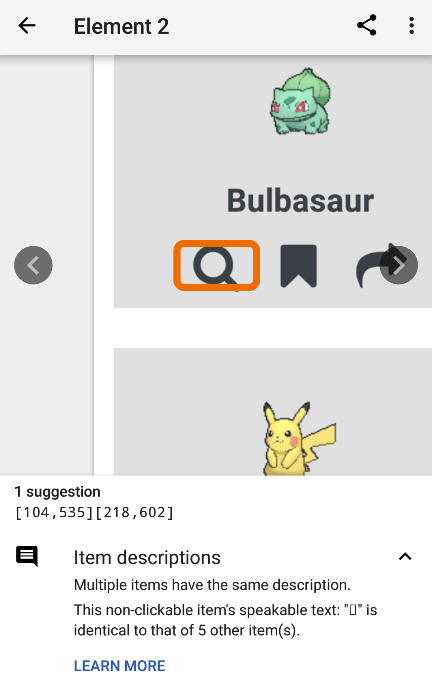 In case you’re wondering why we didn’t add the accessible and accessibilityLabel prop in the Pokemon label, it’s because the Text component is accessible by default. This also means that the screen reader automatically reads the text inside of this component. 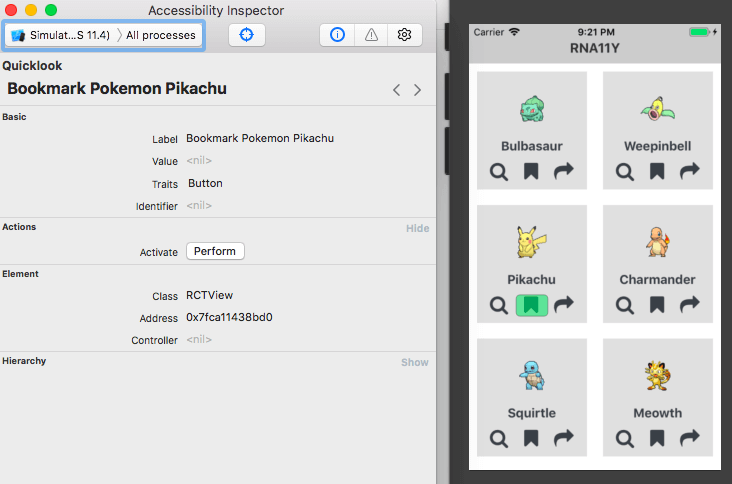 In this section, we’ll take a look at four tools you can use to test the accessibility of your React Native app. 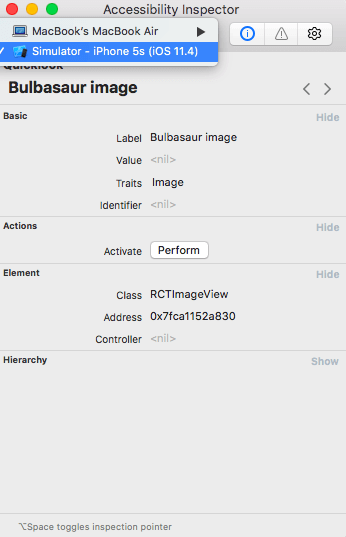 In iOS, you can use the Accessibility Inspector tool in Xcode. Because it’s in Xcode, you have to run the app from Xcode. You can do that by opening the RNa11y.xcodeproj or RNa11y.xcworkspace file inside your project’s ios directory. Then run the app using the big play button located on the upper left side of the screen. Once the app is running, you can open the Accessibility Inspector tool by going to Xcode → Open Developer Tool → Accessibility Inspector. 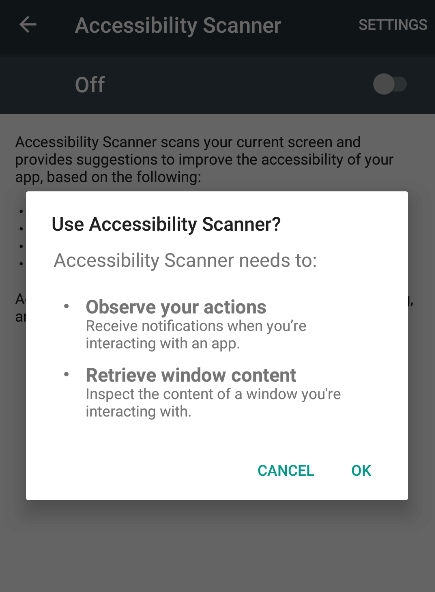 For Android testing, you can use the Accessibility Scanner app. Unlike the Accessibility Inspector in iOS, you have to install it on your emulator or device in order to use it. Once installed, go to Settings → Accessibility → Accessibility Scanner and enable it. The easiest way to solve this issue is by making the card’s background color lighter. You can also try increasing the contrast of the image as suggested. As with anything, it’s always important to test things manually so you know the actual experience your users are getting. After all, accessibility is all about improving the user experience that your users get when using the app. To test things manually in iOS, open Xcode and run the app on your iOS device. You can also do this from the simulator but that kinda beats the purpose of manual testing. You won’t really have an accurate “feel” of the experience if you’re just testing from a screen. Once the app is running on your device, go to Settings → Accessibility → VoiceOver. From there, you can select the Speech menu to change the voice (I personally prefer Siri Female). You can also adjust the speaking rate. Adjust a little bit more from the mid-point should be fast enough for most people. Once you’re done adjusting the settings, enable the VoiceOver setting then switch to the app. From there, you can tap on each of the accessibility areas that we’ve set to verify if it’s being read correctly. To test in Android, run the app on your Android device. Once the app is running, go to Settings → Language and set it to your preferred language. Next, go to Accessibility → Text-to-speech options and make sure the Default language status is fully supported. If not, you have to go to the language settings again and select a supported language. The equivalent of VoiceOver in Android is TalkBack, you can enable it by going to Accessibility → TalkBack then enable the setting. Once enabled, switch to the app and verify if the labels are read correctly as you tap. That’s it! In this tutorial, you’ve learned how to make React Native apps more accessible to a person with disabilities. I hope that you’ll use the knowledge you’ve gained in order to make accessibility a part of your development workflow. Because all of your users deserve an equal or similar ease of use. You can view the code used in this tutorial on its GitHub repo.